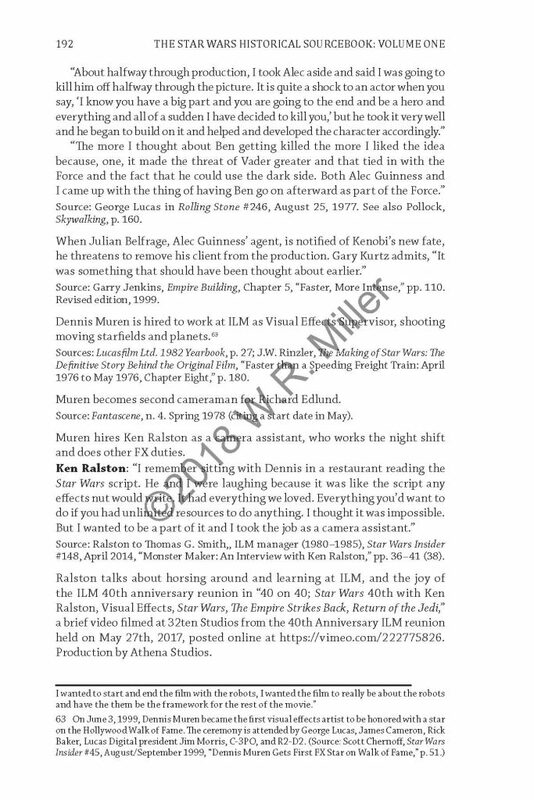 If you’re curious about the content of The Star Wars Historical Sourcebook, here are some sample pages from the year 1976. From these you can see the format of the book. 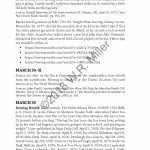 Citations are arranged in chronological order. Quotes are provided from the cast and crew during production. Other citations come from articles about Star Wars. Sometimes I cross-reference when a writer or speaker mentions an earlier or later article, or event. 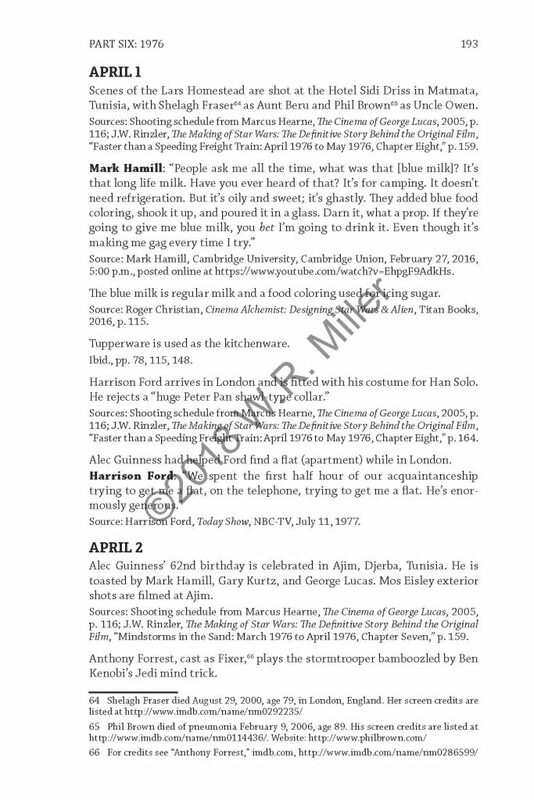 Footnotes provide other details, referencing an actor or technician’s career, or when they die. Links to online videos are provided as well. These are just sample pages. Don’t worry about the watermark. It’s not in the book. 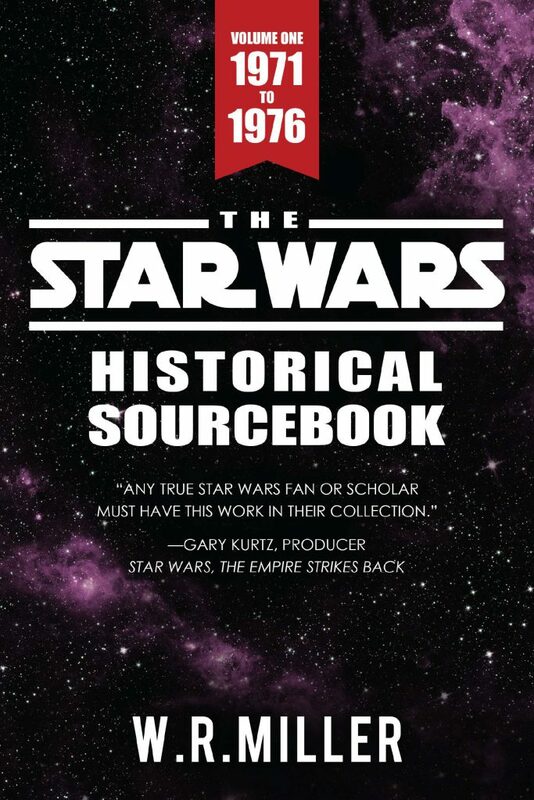 At long last, after 41 years of meticulous research, The Star Wars Historical Sourcebook is now available to the public, through Amazon.com. Volume One covers the years 1971 to 1976. The Star Wars Historical Sourcebook, Vol. 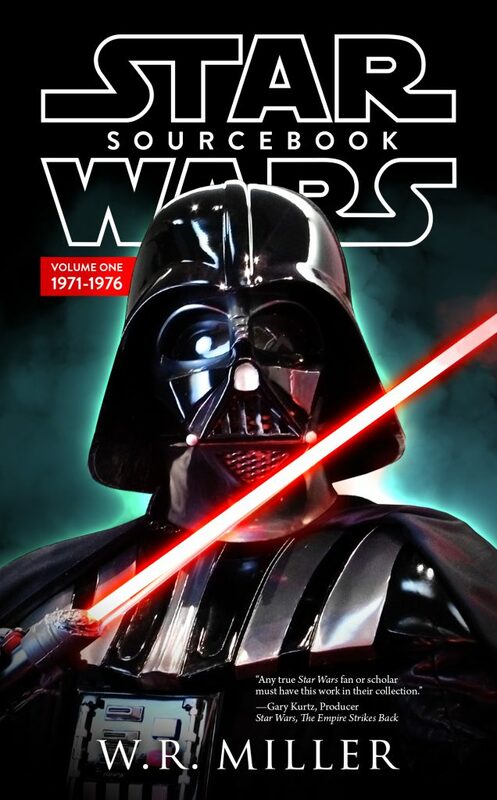 1: 1971 – 1976 Published by Pulp Hero Press (an imprint of Theme Park Press). ISBN 978-1-6839-0148-8, 396 pp. Who was the first Star Trek actor involved with Star Wars? Were Luke and Leia originally twins, according to George Lucas? How old were Mark Hamill and Carrie Fisher at the time of casting? What were the Whills? A throwaway name of little significance or something more? Was Peter Cushing considered for the role of Ben Kenobi? Why did Geoffrey Unsworth, the cinematographer for 2001: A Space Odyssey, decline to film Star Wars? What was Peter Beale’s role in the making of Star Wars? Which actress did Marcia Lucas prefer to be Princess Leia? 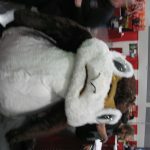 Who were the first people hired at Industrial Light and Magic? What is Anthony Daniels’ favorite science fiction film? How was the lightsaber constructed, and by whom? What is the significance of Leia’s cell block number, 2187? 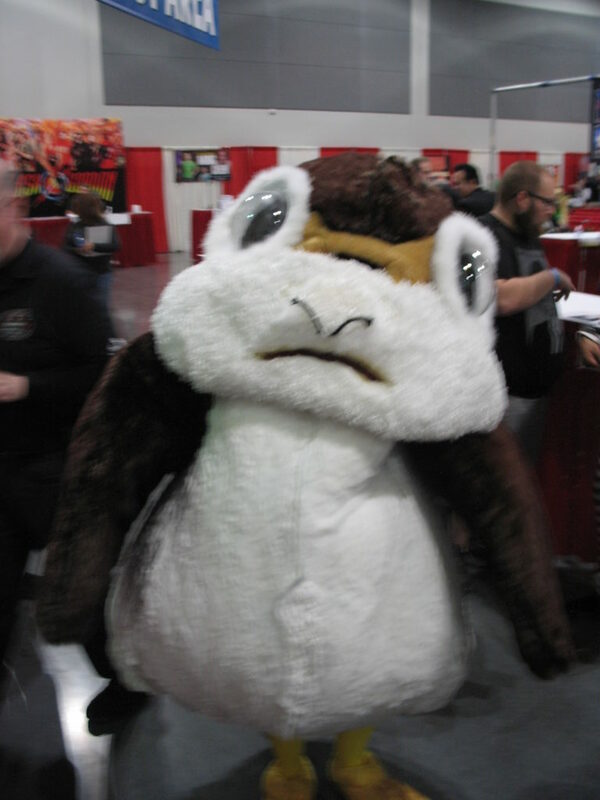 Who defended George Lucas from a skeptical English crew during filming? How did Mark Hamill and Carrie Fisher celebrate the American Bicentennial while in England? Why did Twentieth Century-Fox oppose the title, “Star Wars”? 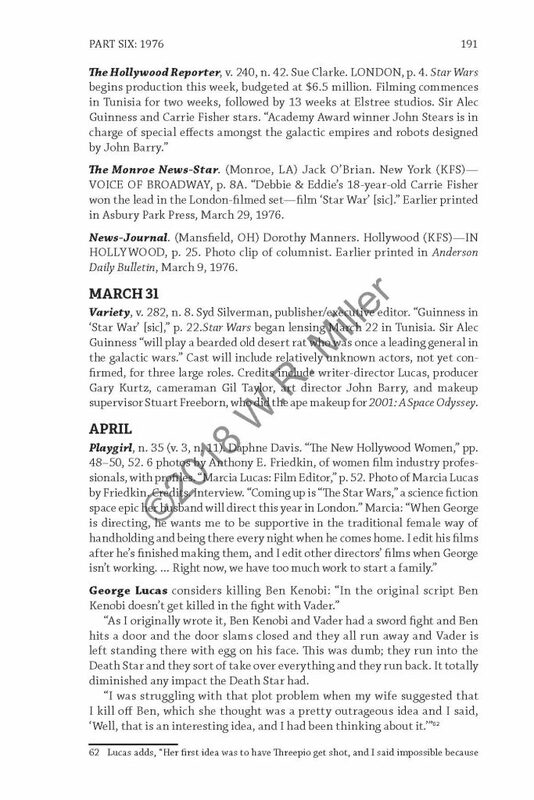 What world-famous celebrity served on the board of directors at 20th Century-Fox at the time? 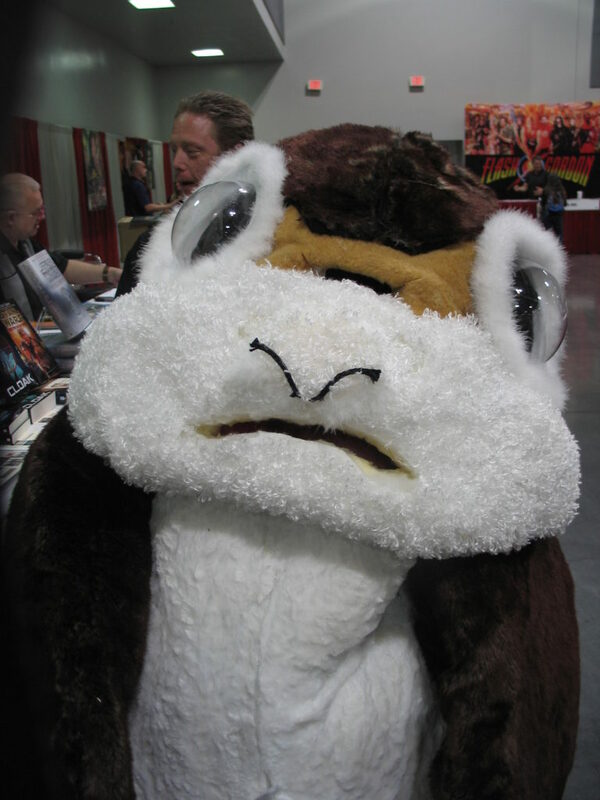 When was the Star Wars Corporation established? What was the “26 for ‘76” campaign? Was the first trailer considered a failure or success? What was “The Lippincott Spiral” and how did it contribute to the success of Star Wars? You can find the answer to these questions, and a whole lot more, in The Star Wars Historical Sourcebook, Volume One, 1971-1976, soon to be available through Amazon.com! Adams, President John Quincy, 1767-1848. An Address delivered at the request of a committee of the citizens of Washington: on the occasion of reading the Declaration of Independence, on the Fourth of July, 1821. Marvel’s Avengers: Black Panther’s Quest is coming this fall to Disney XD.